Hillsboro seniors Sydney Bobbitt, Jordan Williamson and Kailey Dietrick will be honored during senior night on Wednesday when the Lady Indians host Madison Plains. 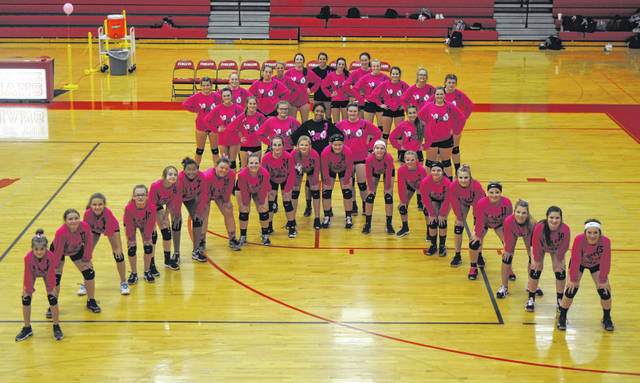 HILLSBORO – Monday was Volley for the Cure night at Hillsboro High School as the Lady Indians volleyball team hosted former South Central Ohio League rival the Clinton-Massie Lady Falcons. The Lady Indians fell to Clinton-Massie in four sets 25-18, 25-17, 26-24, and 25-9. After falling behind two sets to none to start the match Hillsboro looked dead in the water with the Lady Falcons leading 18-12 but, Lady Indians’ libero Jordan Williamson took control of the Hillsboro with the score 13-18 and led Hillsboro to six consecutive service points to give Hillsboro a 19-18 lead. From there it was back and forth as both teams struggled to get a rhythm. 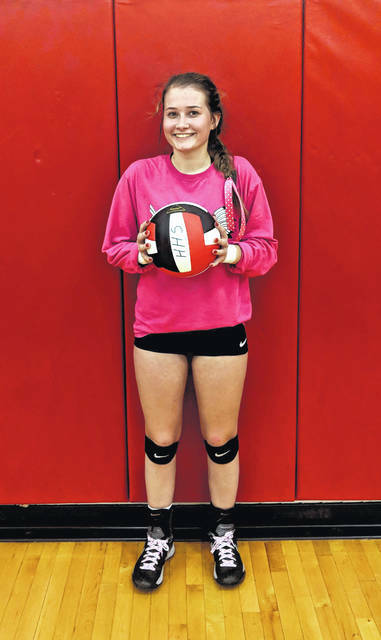 Finally, after a stoppage in play to honor Hillsboro junior Katie Condo’s 500th career assist, with the set tied at 24 Kailey Dietrick led the Lady Indians to two service points for the 26-24 win in set three. “That is definitely a huge milestone for Katie, that is also a school record as far as I’m aware. That was awesome for Katie and we’re proud of her,” said Dickey. The fourth set was dominated by the Lady Falcons as they cruised to a 25-9 win and took the match three sets to one. Sydney Bobbitt played well for the Lady Indians in the match and recorded 10 digs and nine kills on the night. Hillsboro will be back in action on Wednesday when they host Madison Plains for senior night.